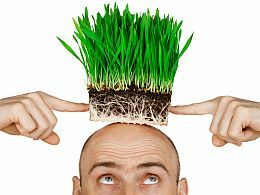 Hair thinning or lack-luster hair can be a very emotionally stressful for both men and women but did you know that there are many natural herbs for hair growth? If you wish that you had much more lush and thick locks, there are some herbs that actually work directly on the scalp to increase blood flow and therefore nutrients to the hair follicles, which potentially leads to healthier and thicker hair growth. One of the major reasons for thinning or lack-luster hair is hormonal imbalance leading to an excess level of DHT (a form of testosterone) that causes hair follicles on the scalp to become weak and break off. Dong Quai, an ancient Chinese herb used for thousands of years for fertility and menopause, has anti-DHT effects that can help rebalance hormone levels and potentially improve hair follicle health. Dong Quai must be taken orally and at dosages that should be discussed with a trained and certified Herbalist. One must make sure that DHT imbalance is in fact an issue before proceeding with taking Dong Quai as a herb for hair growth. This herb has a similar method of action as Dong Quai in that it addresses the imbalance in male hormones in the body. Traditionally used to help Benign Prostatic Hyperplasia (BPH), this herb has the potential to combat excess DHT in the bloodstream and ameliorate hair follicle response to nutrients and blood flow. Peppermint oil contains volatile oils that stimulate blood flow to an area by causing blood vessels to dilate. If rubbed directly onto the scalp, the vessels are dilated which encourages nutrient-rich blood to feed the hair roots and follicles. Peppermint oil must be diluted in a carrier oil (jojoba oil or almond oil for example) before being rubbed into the scalp as at high concentrations it can cause skin irritation. This delicious and peppery herb is also known for its vaso-dilating abilities, much in the same way that peppermint is. When diluted in a carrier oil and rubbed into the scalp, it encourages blood flow to the hair follicles. Try mixing it with peppermint for an added effect. One of the main ingredients in the hair shaft is Silica, a mineral found in various foods. Horsetail is a plant that is extremely high in its silica content which, when consumed, will increase the body’s own silica content. This will potentially encourage healthier hair growth by providing the body with one of the major ingredients of hair development. There are no panaceas for healthy hair growth, but if you nourish yourself properly with the essential nutrients needed for healthy hair and connective tissue (Silica, B-vitamins, Collagen) and address any imbalances internally (blood flow, hormones) that could be affecting the health of your hair, you are well on your way to healing yourself naturally. Your hair is a sign of vitality and proper nourishment both internally and externally. A proper diet, hydration, exercise and addressing any imbalances with these herbs for hair growth can help provide you with a healthy mane of gorgeous hair.